Sixteen years ago two men settled down in the apartment in a house built in 1907 in Vienna. In fact, the apartment belongs to one of the men since he is the grandson of the man who owned the house in the 1930s. 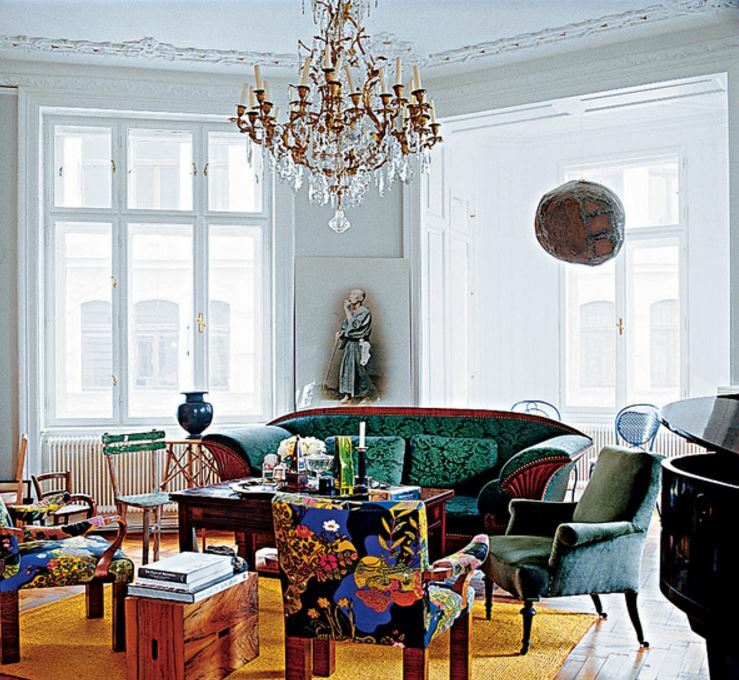 Living in this apartment and repairing it, the designer Michael Embacher realized that the interiors can be described with the same words as the love relationship. 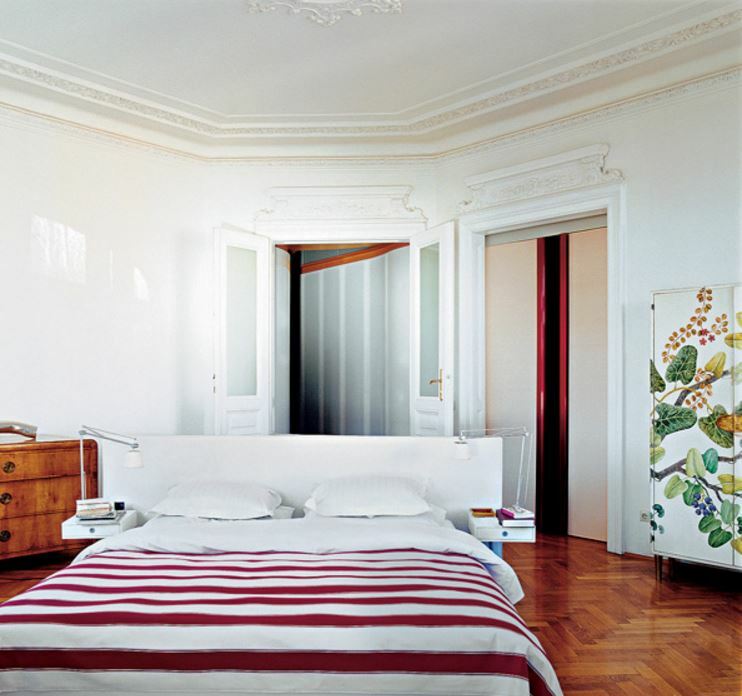 Rooms are like people – sexual and responsive, stubborn and intractable. Christian Witt-Döring has been the curator of the Austrian Museum of Applied Arts furniture and woodwork collection for a quarter of a century. He is obsessed with furniture and therefore it overwhelms the house. Although, eight years ago, he started the ‘cleaning’ process. He threw out and sold a lot of cozy details. It was clear that he wouldn’t stop at that point – so he began slowly rebuilding the house. In the dining room, there is a garden table from 1870s with a metal base and a stone countertop. Designed for fourteen people sitting around, it was brought into the apartment by four loaders. 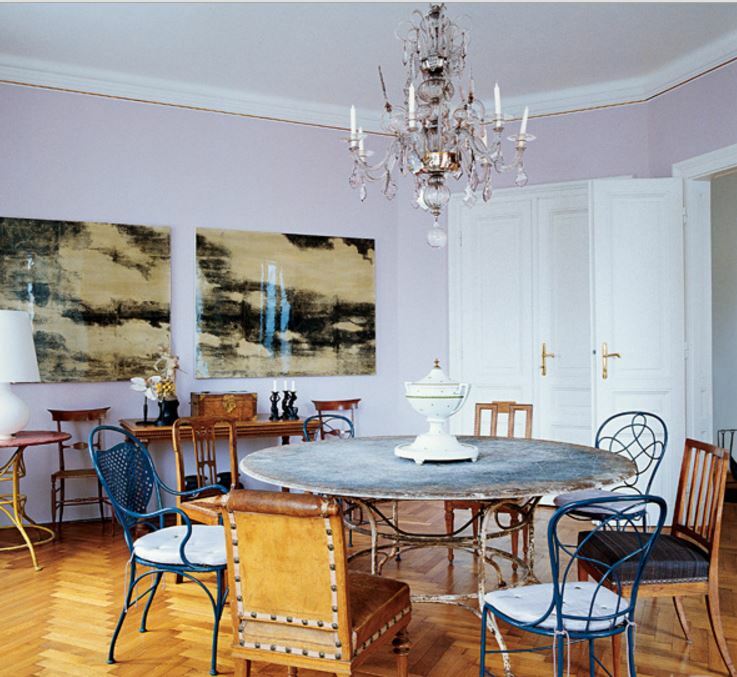 A diverse set of wooden and metal ‘Viennese’ chairs of the end of the XIX century is placed around the table. Vase made by Vienna Porcelain Manufactory in 1801. Lacquered images of clouds, the work of contemporary Austrian artist Eva Schlegel, placed on the wall. Michael Embacher designed the new balcony doors and a fireplace, trimmed with birch (by the way, in order to avoid hasty conclusions: a sculpture of a naked muscular young man, which is placed in a niche above the fireplace, was placed there not by Christian but by his grandmother). Books are stored on the steel shelves which weigh half a ton. The library also features the Biedermeier table. The main Michael’s achievement is library. Its steel shelves are mounted on the walls and weigh half a ton (without books). Christian initially wanted to install these shelves in the dining room. Then, he finally decided to separate these two pleasures. On the one hand, he has a giant garden table made of metal and stone in the dining room now. On the other hand, the table has brought to the liveliness into the apartment: if one pours water at dinner, the table overgrows with moss again. 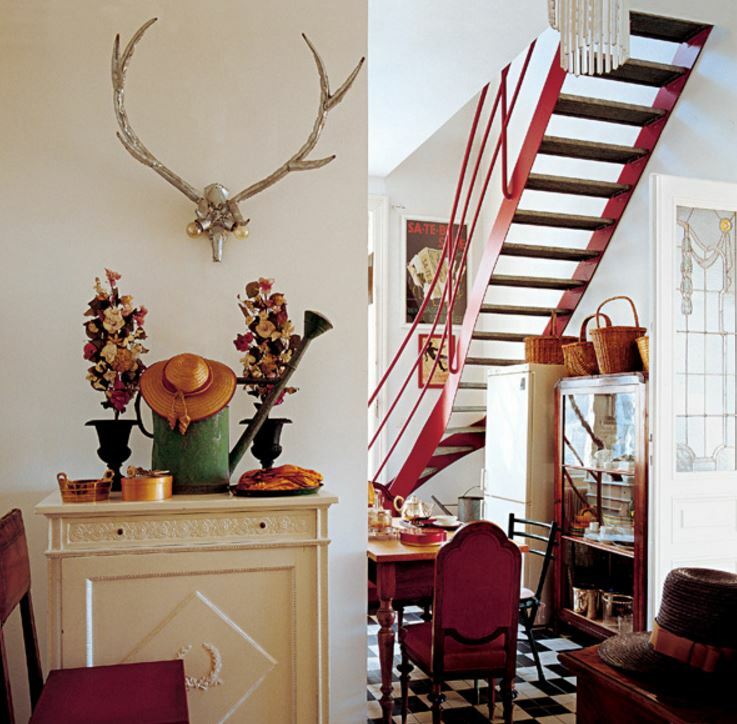 In the kitchen, there is an aluminum wall lamp in the form of deer antlers, a work of contemporary German sculptor Gёtsa Storm. A steel staircase made in the 1980s. One time it seemed that the renovation in the apartment will never end. Something new would always appear like this moss on the dinner table. But in fact, the last adventure was the construction of a two-story dressing room designed by Gisela Podreki.